A great article about Maremma is published in the May 2010 issue of VINUM magazine. The title is “Die Maremma wird nicht untergehen”. The article says that in spite of the general crisis of the wine industry Maremma wines will grow and prosper. 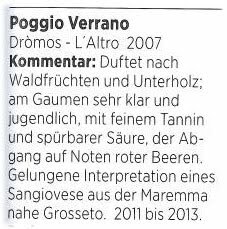 Then it says that Sangiovese is one of many varieties grown in the region and that Maremma is more similar to Bordeaux than to central Tuscany (Chianti, Montalcino, ecc) ... “Liebesgruesse nach Bordeaux”. 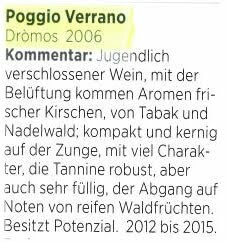 Enjoy the comments by the wine critic Christian Eder.